I’m still thinking of this beach. 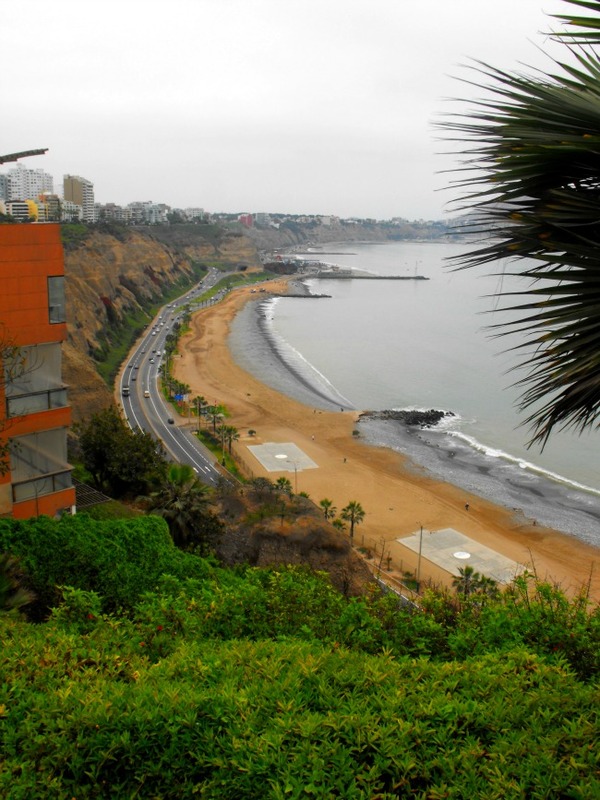 It’s the beach in Lima, Peru, which I got to visit a couple of years ago. But really, I didn’t actually visit the beach. I had a day to explore the city before heading elsewhere in the country, and was happy to start my morning walking along the top of the cliffs above the beach. I could see the swells coming towards the beach, spotted an occasional person walking along the sand in the morning and then could see a few surfers sitting on their boards waiting for the waves. The sand was a pale caramel colour from my view, and although it was a gray morning, and Pacific Ocean didn’t look as inviting as it usually does, I wanted to feels it salty touch and feel the sand under my feet. And the city lured me in – I wandered through some boutiques, looked at the architecture and kept discovering the city. Wandering into a market and then into a church and continuing my exploration, I kept reminding myself I would go back to the beach. But the day continued, and after lunch I met some colleagues and we did more exploring. And soon it was sunset and I still hadn’t gone to the beach. As the sun disappeared for the day, I wanted to sneak off for a few minutes of solitude at the beach, but alas it was not happen. So although I wished it to work out, I never did set foot on Lima’s beach. But I promise, I’m still thinking of you….